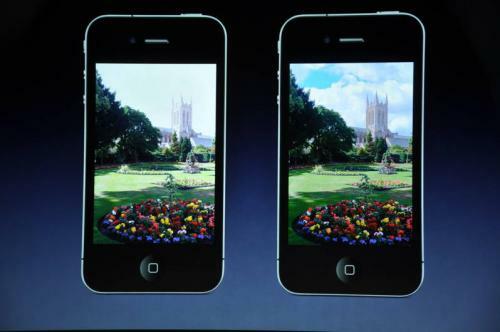 At today's keynote event, Steve Jobs announced the upcoming availability of iOS 4.1 for the iPhone and iPod touch. Jobs noted that the long running proximity sensor, Bluetooth, and iPhone 3G performance bugs that have been raised by users will be fixed in this update. 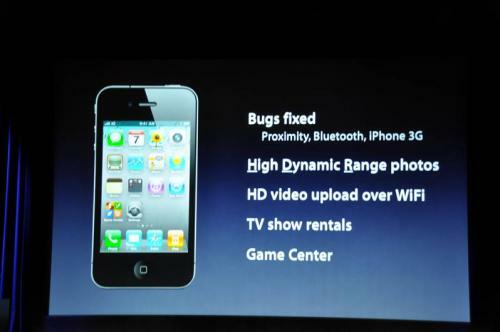 New features to iOS 4.1 include High Dynamic Range photos, HD video upload over Wi-Fi, TV show rentals, and Apple's Game Center will make its official debut. High Dynamic Range photos are photos created using 3 separate photos captured in quick succession at varying exposure levels. The photos are then combined using some complex algorithms to create an enhanced composite photo. Game Center, which was first introduced earlier this year, will officially be included in iOS 4.1 and allows gamers to invite others to play, post scores to online leaderboards, and more. iOS 4.1 will be available next week for iPhone and iPod touch and will be a free update. Jobs also revealed that iOS 4.2 will be released in November, finally bringing iOS 4.x support to the iPad. The free update will include wireless printing as well as a new feature called AirPlay, which replaces AirTunes. AirPlay will offer streaming of video, music, and photos. iOS 4.2 will be compatible with the iPad, iPod Touch and iPhone. Update: While Apple's U.S. and many other sites simply states that iOS 4.1 is coming soon, some international sites such as the Spanish one, as well as the company's press release announcing the new iPod touch note that iOS 4.1 will become available next Wednesday, September 8th. Existing second and third generation iPod touch users can update to iOS 4.1 free of charge on September 8 to enjoy new features including Game Center.